When traveling to Disney World, MagicBands are your keys to the kingdom. Quite literally! If you haven’t been to Walt Disney World since the Resort started using MagicBands, you might be confused with what they are and how they work! 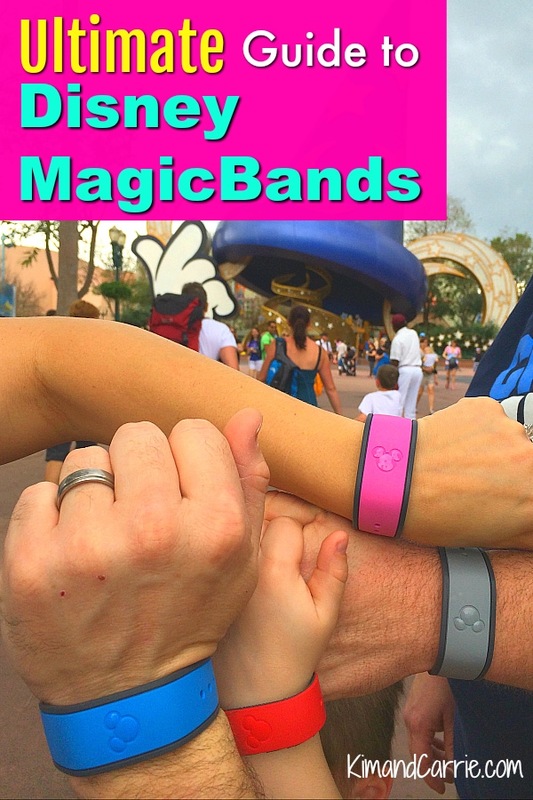 Simply put, Disney MagicBands are waterproof bracelets that you wear (but you don’t HAVE to). There is an RFID chip inside the MagicBand to store information about your Disney vacation and can be used at special kiosks in the Disney theme parks. Your location information is used via encrypted codes to deliver more customized experiences inside the theme parks. However, GPS is not used to identify your location information. MagicBands really make your stay a more pleasant experience. There is no need to fear the technology of MagicBands! I’ve been using Disney MagicBands since before they were ever introduced to Disney guests. Really! When my husband worked for Walt Disney Imagineering, we were offered a free night’s stay at Disney’s Animal Kingdom Lodge in exchange for testing out Disney MagicBands before they were introduced to guests. We wore the Disney MagicBand prototypes at the hotel, in the stores and at the Magic Kingdom. The MagicBands were so new at the time that not all locations were even set up with a Magic Band touch point system yet. I think we purposely had problems installed with our test version of the Disney MagicBands. When we tried to get into the Magic Kingdom, our MagicBands did not work. It must have been to test Guest Relations cast members in seeing how they would help Disney guests with certain problems that could arise using the Magic Bands. It was a lot of fun testing the very first prototypes (and also staying at Disney’s Animal Kingdom Lodge, too)! Most Disney guests would stare at us when we went to try to use the new bracelets. Some didn’t know what they were. And others were just really intrigued with the new technology being introduced. What was great fun was seeing the Disney cast member’s reactions, too. Many of them had never done transactions with the MagicBands at that time. When you stay at a Disney resort you get your MagicBand complimentary. To have the MagicBand mailed to your home, you must make a reservation at a Walt Disney World Resort hotel at least 11 days before you arrive. If you are not able to be at home to receive the MagicBand before your Disney World vacation, you can get a MagicBand at your Disney resort during check in. Keep in mind if you do not customize your Disney MagicBand in the checkout process, you will receive a gray MagicBand. Your name (first name only) will be printed inside the Magic Band so that you can keep track of whose MagicBand belongs to each person. Keep in mind, your MagicBand will work for FREE no matter what it looks like or how pretty it is! Disney World Annual Passholders get free Magic Bands, too. But you must make sure you allow enough time to receive your MagicBand before leaving on your Disney World vacation. Disney World Annual Passholders must allow at least 11 days between ordering annual passes online and leaving home to travel to Walt Disney World. The Disney World Annual Passholder MagicBands will need to be mailed to your address. If you are unable to receive your MagicBand in the mail at home, Annual Passholders can receive the benefits of using their Annual Pass by showing their card. Smart Tip: Here’s a way to customize your FREE MagicBand at home! Check out this tutorial on How to Make a Personalized Glitter MagicBand. There are plenty of custom options for decorating your Disney Magic Band. But those cost extra. You can even buy limited edition MagicBands and other MagicBands with more detailed artwork. If you want to customize your Disney MagicBand to showcase your favorite character, celebrate the holidays or make sure you don’t confuse your MagicBand with anyone else’s, there are plenty of options to do so! Before you leave for Walt Disney World, you can order Disney MagicBand accessories online. There are so many fun styles to choose from. And they will be cheaper than paying Walt Disney World prices in the theme parks and at Disney resorts. At Walt Disney World, there are plenty of options to buy to customize your MagicBand. You can exchange your free Disney MagicBand for an upgraded, paid version (starting at $19.95, plus tax). The upgraded MagicBand will have all of the same perks as the free MagicBand. However, it will have different art work. And it will NOT have your name printed inside. Buying limited edition MagicBands through Walt Disney World can include additional experiences, such as sounds and lights, at select locations. 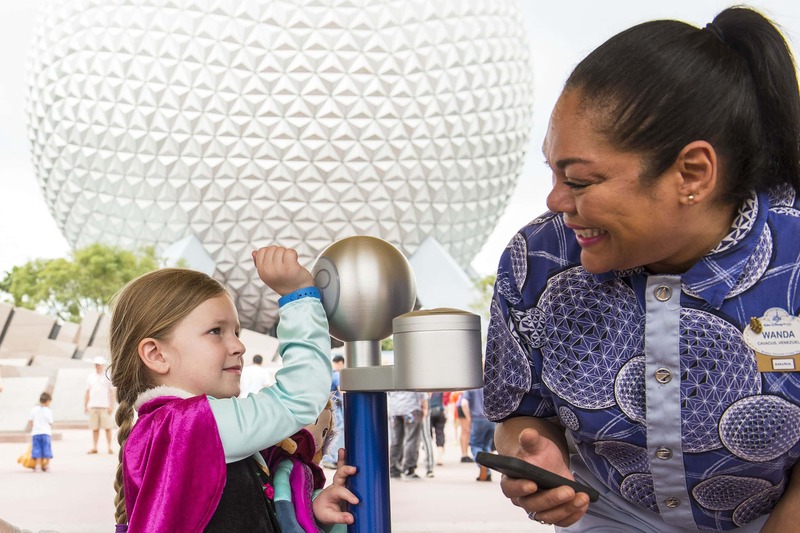 Linking your MagicBand to the My Disney Experience app will simplify your Walt Disney World Resort experience. The My Disney Experience app manages your entire vacation. Essentially, it is a wallet for your tickets, reservations and FastPass+ times. 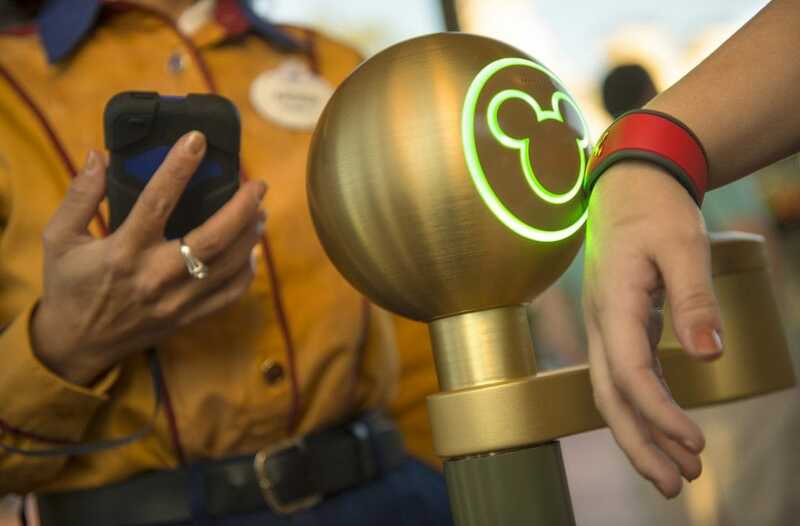 By linking your MagicBand to the My Disney Experience app, you don’t have to remember to bring written notes and reservation times, papers with your FastPass+ reservations on them, or other vacation info that is easy to leave behind. Nope, mom can’t wear the band for everyone’s tickets and passes. Sorry. Each person must have their own Disney MagicBand attached to one theme park ticket, multi-day tickets or pass only. You can use your MagicBand for almost all purchases at Disney World. Only once did I run into a problem where I needed to use a credit card rather than my MagicBand. ONLY Disney Resort guests can use the charging feature! Disney World Annual Passholders CANNOT pay using their MagicBand. Unless, of course you are a Disney World Annual Passholder who is also staying at a Disney Resort hotel. You can scan your MagicBand at the point of purchase by touching the Mickey head on the band to the Mickey head on the touch point pad and enter a four digit pin. 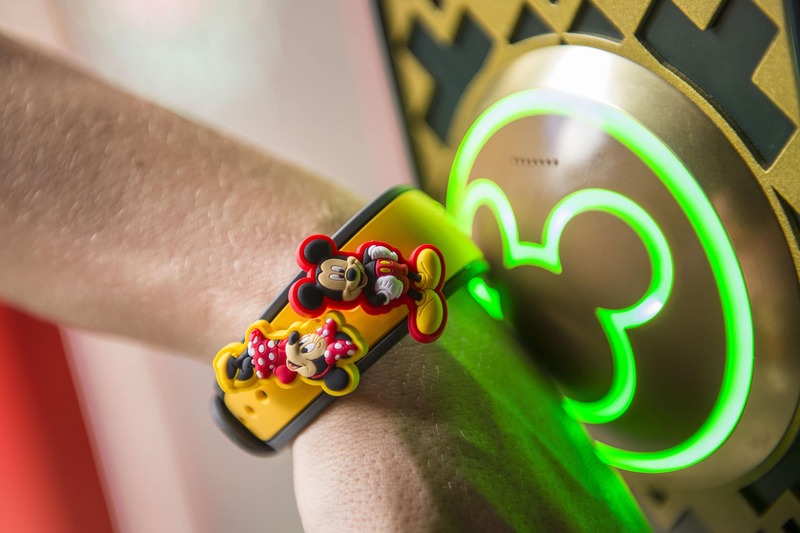 Everything you buy with the MagicBand, from souvenirs to meals, gets charged to your room. You are able to decide which credit card is attached to the MagicBand for purchases. Worried about kids spending too much? You can disable payment options on selected Magic Bands if you’d like to. Spending limits can be set on your Disney Magic Band, too. If you want to keep yourself under budget, or prevent family members from buying too many souvenirs and snacks, be sure to set a spending limit for charging on your Disney MagicBand. Don’t worry about having to cover your Disney MagicBand on water rides or in the rain. Disney MagicBands are okay to get wet. But there’s really no need to wear them in the shower……. When you go on certain attractions you will sometimes get personalized messages. I would expect this technology to be used in more interesting ways when Galaxy’s Edge opens, but it’s fun to see your name at the end of It’s a Small World (note, these special effects often change). More importantly, ride photos are automatically linked to the My Disney Experience app via your MagicBand. This happens at attractions such as Frozen Ever After at Epcot. In Be Our Guest restaurant, breakfast and lunch are a quick service meal. Which means you order and then go pick a seat anywhere in the three available rooms in the restaurant. Wearing the Disney Magic Band will alert the food servers to where you are seated. Your location will be given to them without you having to use a number on your table, or try to tell a server where you are seated. One of our transportation tips for Walt Disney World is to NOT pack your Disney MagicBand in your luggage if you are flying. If you are using Disney’s Magical Express, you will need your Disney MagicBand with you to check in for the bus transportation. PLUS, you’ll need the MagicBand to get into your room before your checked luggage might arrive. Even if you don’t plan on using Disney’s Magic Express, do NOT check your Disney MagicBand into checked luggage. If your luggage is lost or delayed, you will not be able to get into your Disney resort hotel room. Not staying at Walt Disney World Resort hotel? Not an Annual Passholder? You can still use the convenience of a MagicBand. You are able to buy Disney MagicBands in the theme parks and link your theme park ticket to the MagicBand (current prices start at $12.95 plus tax). There doesn’t seem to be too much value to this, unless you’re just really worried about losing your ticket and think wearing the bracelet would be easier. Is your Disney MagicBand too big? You can customize it to make it smaller! 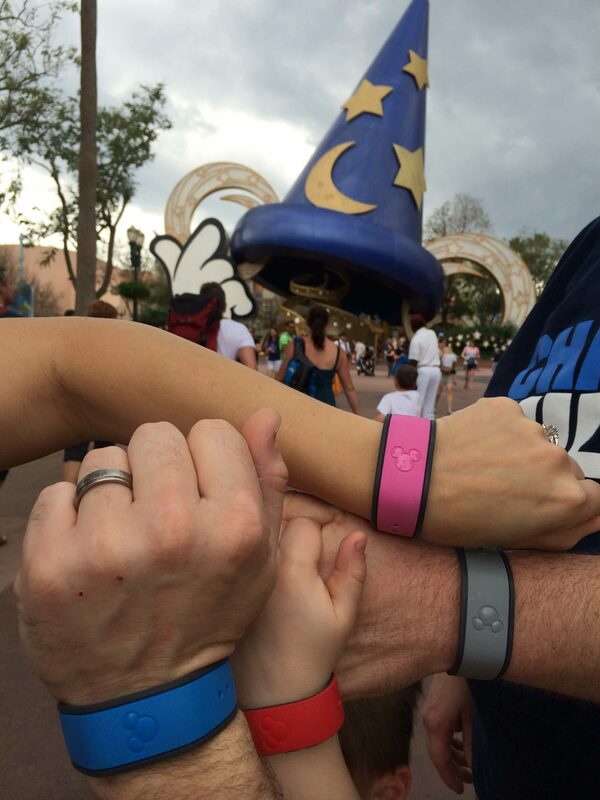 MagicBands are one-size fits all. But each Disney MagicBand can still be customized for kids and adults. The MagicBand will have a tear away outer layer that can be removed. Taking off this extender will make the Disney MagicBand even smaller, perfect for kids. Each MagicBand will also have a variety of holes, too, to adjust the size of the bracelet on your wrist. If you’ve spent money to customize your Disney MagicBand, you probably don’t want to give it up! That’s okay! MagicBands can be reused. Just make sure the Disney MagicBand is still linked to your My Disney Experience app. Or, reuse an old MagicBand when you visit the theme parks but aren’t staying at a Disney resort. Then you don’t have to pay for a new Disney MagicBand. However, a Disney MagicBand can only be linked to one person and one account. You cannot reuse a Disney MagicBand for another person. If you buy legitimate and legal Walt Disney World theme park tickets from a reputable source other than Walt Disney World Resort (such as AAA or Undercover Tourist), you will be able to link your theme park tickets to your Disney MagicBand. This will be done in your My Disney Experience app using a code provided to you. What Happens If You Lose Your MagicBand? Don’t worry. Contact Disney’s Guest Relations (at the theme parks or Disney Springs) or your Disney Resort Guest Relations. They will shut down your old Disney MagicBand and stop shopping privileges. Then you will be issued a new Disney MagicBand. You will still have access to all of your reservations, FastPass+ reservations and room key on your replacement MagicBand. Don’t worry. Disney World MagicBands are made from a non-latex, hypoallergenic material. 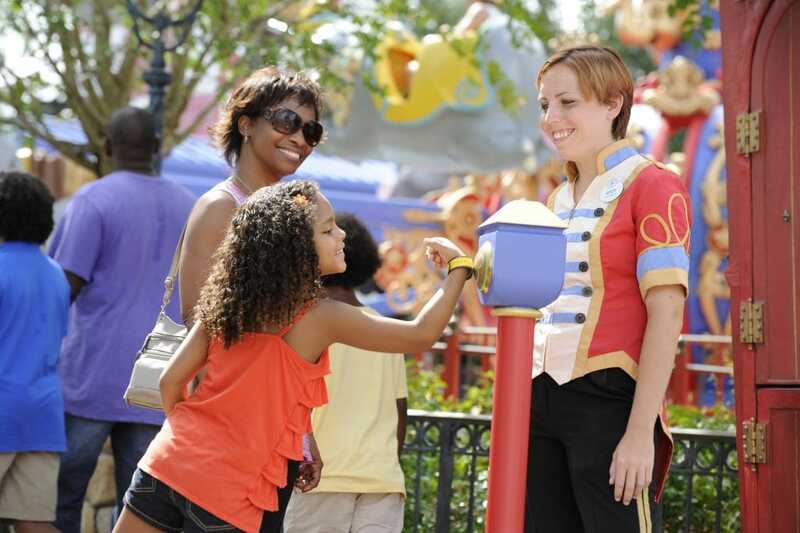 Worried about your child getting lost or separated from you at Walt Disney World? 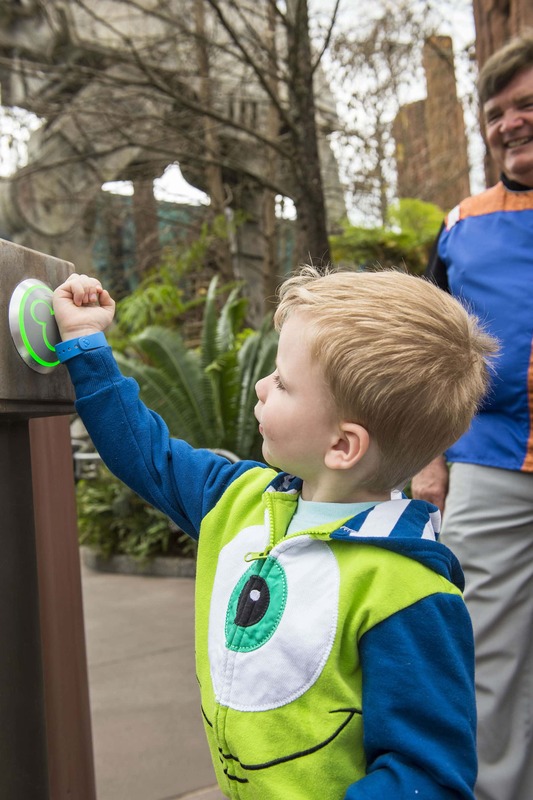 If your child is wearing a Disney MagicBand and gets lost, a cast member can scan the bracelet and get contact information to help you reunite. We also suggest using products such as Safety Tats just to be sure your contact information can be found with your child. Just like I stated at the top of the article, Disney MagicBands are not fool proof. And they don’t always work right. While THEY SHOULD work, it doesn’t mean you might get stuck with a problem with the MagicBands. Which could mean missing FastPass+ times, not being able to charge for souvenirs or food, or having theme park tickets not work. Just to be safe, print out an itinerary with your theme park ticket confirmation numbers or other identifying information. That includes any Disney’s MagicalExpress information. Also, alway bring a form of payment with you, whether cash, Disney gift cards or a credit card. You should be able to leave all of that stuff behind and travel lightly with just a Disney MagicBand. But technology doesn’t always work right. You could spend minutes or hours trying to fix the situation if your MagicBand doesn’t work or the technology goes down at the theme parks (it’s happened to me before). Or you could just pack a credit card and a piece of paper in your backpack and not have to stress about one more thing. There are lots of ways to display and enjoy your Disney MagicBands after you come back home. Check out this awesome wreath made from Disney Magic Bands! We’ve got great Disney DIY Craft Ideas on Pinterest. Be sure to follow our boards for unique ideas!